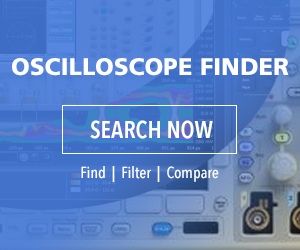 A Tektronix MDO3104 oscilloscope is used to demonstrate the use of Automatic Measurements as a troubleshooting and design tool. Greetings and welcome to our 63rd Test and Measurement Video. Today we’ll look at taking automatic measurements in the time domain, using the Tektronix MDO 3104 oscilloscope. First, we’ll need a signal to measure. A Tektronix MDO 3000 series oscilloscope has an available internal arbitrary function generator, so we’ll start with that. The output on the back panel is labeled AFG Out, and it can be very easily connected by means of a BNC cable to the channel one analog input on the front panel. When the AFG button on the front panel is pressed, the default sine wave is activated, and since by default Channel One goes active when the oscilloscope is turned on, the signal is immediately displayed. The sine wave parameters are initially set by default and they may be viewed in the oscilloscope display since AFG is on. Press Waveform to see the types of waveforms that are in the AFG library. Then press Waveform Settings to view some parameters: frequency/period, amplitude/offset and high level/low level, which refer to the positive and negative going peaks of the waveform. Output Settings opens another menu at the side of the display. Load impedance can be set at high Z or 50 ohms. Up to 100 percent noise can be added to the signal that is displayed. Here’s what 15 percent looks like. The auxiliary output can be main trigger, event or AFG. High and low level can be set. Presets can be determined by the user or made to conform to transistor-transistor or complementary metal oxide semiconductor logic. To view these measurements, simply select them using Multipurpose Knob b and then press the soft key associated with the desired measurement. Let’s go back and choose the square wave. Now we’ll scroll down to frequency and add measurement. Notice that a very interesting window comes up that shows a relevant formula, a generic image of the waveform and a descriptive statement. For this parameter it is noted that frequency is the reciprocal of period, and we are reminded that frequency is inversely related to time. Similarly, we can scroll through the parameters and relevant information for each type of waveform that is displayed. Returning to Frequency, we’ll press OK Add Measurement. In fact, we’ll press it three times to show how it works. To see the results, it is necessary to press Menu Off. And there are the multiple measurements, in this instance all identical. Each measurement has the value, 100.0 kHz as set in the AFG, plus mean, minimum, maximum, and a very slight standard deviation. These are the automatic measurements. The settings survive in non-volatile memory when the instrument is powered down. However, the actual measurements as opposed to the settings are being made in real time. • Indicators places lines on the display, highlighting the portion of the waveform that is being measured. For example, in Frequency the first complete cycle including positive and negative going parts is indicated. • DVM can likewise be turned on or off. It generates a digital multimeter-type readout above the display with large clear characters showing in this instance voltage and frequency. • Waveform Histograms may be set to show vertical or horizontal histograms, which are time-correlated graphs depicting the waveform metrics. The display can be made linear or logarithmic. • Gating determines whether the metric will be full-screen or constrained between cursors. • Statistics likewise can be turned on or off, regulating whether the metrics are displayed for each measurement that has been added.